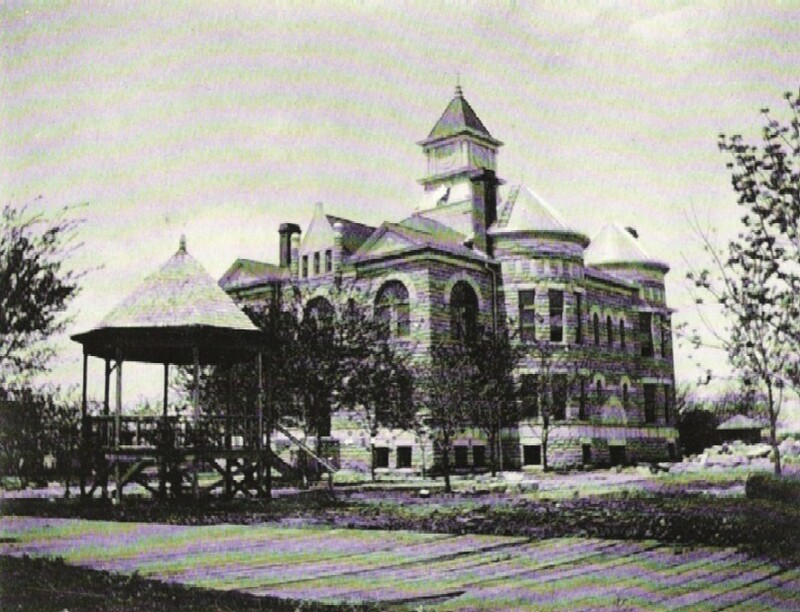 A new courthouse was needed after 1873 stone building built by Myron D. Green was completely destroyed by fire on the night of December 7, 1898. County commissioners David Swank, David Shaver, and William Mueller immediately began the process of planning a new building. In January 1899, a bill was introduced in the state legislature to permit the commissioners to proceed with plans and construction. It quickly passed both houses. Three architects were considered and after examining their plans, in April, C.W. Squires of Emporia was employed. Squires estimated the construction would cost $18,322. His fee was to be four per cent of the contract price less $200. The deduction was made since Squires could not be on the project grounds as much as the commissioners thought necessary and a local superintendent would have to be hired. Bids were taken in August 1899. The commissioners met three times to open bids before they accepted the bid o W.P. Baker. According to the Lincoln Sentinel, “Our county commissioners displayed good judgment in giving the contract to a home man. The money paid in wages will now be distributed among our Lincoln county mechanics and laborers. Farmers, having stone quarries in this vicinity, will have a chance to sell their rock instead of new quarries being opened up.” The Sentinel also reported that a force of a dozen were a work on the excavation under the direction of B.P. Wicker. A.E. McMichael was the stonemason. Fifteen men were at work on the grounds and in the quarries and Mr. Baker was still advertising for more laborers. The courthouse was made of Lincoln County stone, quarried, hauled, trimmed and put into position by Lincoln County men. W.P. Baker subcontracted all the interior finish materials-door and window frames, stairs, etc. for the courthouse to O.W. Urich, of Atchison, Kansas and the ironwork to William Bergh of Newton. By mid January 1900, the walls were almost up and as March ended the windows were being installed. The roof was finished in late April and by mid-May the plastering was completed. The commissioners decided that there was not enough time to plan a cornerstone laying ceremony, so none was held. (click here to view picture) The building was ready for occupancy around mid July 1900. The total cost for construction was less than $20,000, and an additional $5,000 covered furnishings, vaults and heating. The building was built completely debt-free by using insurance proceeds and special railroad taxes. One of the largest crowds in Lincoln history attended the dedication ceremonies held Thursday, September 6, 1900. All the pupils of the local public school, preceded by two town bands, marched to the courthouse to participate in a flag raising ceremony. There was a speech given by E.D. Smith, the county superintendent of schools, to the assembled multitude urging the necessity of patriotism and the highest ideals in life. Bicycle races, foot races, and a baseball game followed singing. A prize consisting of a rocker was awarded to both Mr. Richard Clark, of the Twelve Mile Creek, Colorado Township, as the oldest settler and to Mrs. Thomas M. Strange for having the largest number of children born in Lincoln County, having a total of fourteen Children, with twelve born in Lincoln County. The courtroom was full in the afternoon to hear T.H. McMichael sing a solo, followed by music with a chorus of fifty voices and speeches by Hon. T.F. Garver, of Topeka and Judge R.F. Thompson. C.B. Daughters, on of Lincoln’s leading attorneys, also gave a speech. Later in the afternoon there was a ball game between Ellsworth and Lincoln county teams. Ellsworth eventually took home the $75 prize. The Lincoln Brass band and the Spillman Band furnished lively music at the opera house. The courthouse, which is situated on a square just east of the Lincoln district, was designed in the Richardsonian Romanesque style. The principal building material is the local limestone, sometimes called post rock, cut in the cyclopean style. The courthouse is two stories high with a basement and is 87 feet north to south and 67 feet east to west. The building, which is symmetrical on axis, is surmounted by a central clock tower. Both the eastern and western facades have two semi-circular projections, which divide the flat wall surface. These facades are also symmetrical. An entrance down to the basement floor in centered on each façade. The entrance accentuated by a blind arch over the door. The entrance opening on the west side was later enclosed. The trim on the building is a lighter limestone, which mainly accentuates the openings. Many of the arches have keystones. A Wide limestone string course rums above the lintels of the basement windows. The cornice is wood and ahs a blank frieze and dentils. The first stage has a mansard type roof with a window centered on every face. Below this stage is a painted wood balustrade and a cornice with dentils crowns it. The second stage has flat faces with an Ionic column on each corner. A clock is centered on three sides. From this stage rises a spire, which is topped with a pinnacle. Remodeling, Repairing, And Alterations At some point the courtroom was divided in half. The ceiling was lowered and the back wall paneled, losing much of the original ornamentation. In 1956 extensive repairs were made inside the courthouse. All the electrical wiring and the outdated fixtures were replaced. The entire interior of the building was repainted. In 1991 with help from the Kansas Department of Commerce, Small Cities Community Development Block Grant Program work was done to make the courthouse handicapped accessible. Architectural barriers were removed and an elevator added. In 1993 the Kansas State Historical Society awarded the Lincoln County Courthouse a Heritage Trust Fund Grant to help with restoration. When the original blueprints were brought out to begin remodeling work, the contractor was startled to see no measurements! This project included repairing and replacing exterior ornamental metal and wood work in the clock tower; repairing, and painting fourteen semi-circular transoms above the large windows; repairing and tuck pointing exterior masonry and other extensive work was done. The cost of the project totaled $64,000 with the grant covering 80%.